There is nothing better than spending Sundays well. If you are staying in Keswick, Cockermouth or in the area, why not enjoy the beauty of Buttermere and have Sunday Lunch in the hotel`s Dining Room? In real tranquillity with spectacular views, enjoy a two- or three-course lunch. We take bookings between 12 noon and 2 pm, and we can cater for groups or private events as well. We serve Sunday Lunch every Sunday in the hotel`s restaurant. 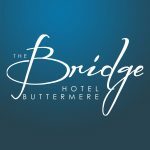 Please book your table by calling reception on 017687 70252 or email enquiries@bridge-hotel.com. Please note, we have limited seats available in the Dining Room. We serve Sunday Lunch in the bar every Sunday from 12 noon until we run out. We do not take reservations in the bar area and we offer the Bar menu as well as Sunday Lunch choices. We are dog and family friendly.